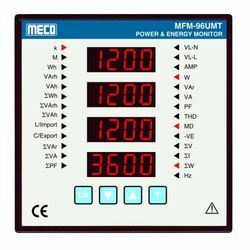 As per the variegated requirements of our clients, we are offering a broad range of Multifunction Power and Energy Monitor. The offered product is designed at our end utilizing top quality material and advanced technology, in adherence with set norms. This product is highly demanded among customers owing to its reliable performance. We also offer product in numerous specifications to customers as per their requisites. Auxiliary Supply 110V AC ±20%, 50Hz (Optional). Looking for Multifunction Power and Energy Monitor ?